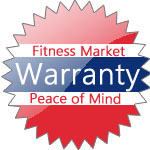 Just $10 per week... on exclusive Fitness Market treadmills! No Interest! | Quick Approvals! Compare our exclusive treadmills with that offered by others and you will see the difference is better value, quality and bigger range of features for only $10 per week*. An easy, in-store application takes 15 minutes with instant over-the-phone approval notice. In addition, we can tailor a custom fitness equipment package to suit your needs and all the equipment can be put on one finance application! *Based on 24 month payment plan through Certegy Ezi-Pay Advantage, a loan provided by Certegy Ezi-Pay (ABN 28 129 228 986). 25% deposit payable on purchase. Full Price is $1495 plus a once off establishment fee of $60 payable over the term of the loan and a per payment processing fee of $2.50 applies. Terms are available on application. Delivery charges are additional.